Filmed during the A.R.M.S. Charity Concert, that took place at the Royal Albert Hall, London in September 1983, Eric Clapton leads a star-studded performance of “Layla” featuring; Jimmy Page, Eric Clapton, Jeff Beck, Steve Winwood, Andy Fairweather-Low, Bill Wyman, Kenney Jones and Charlie Watts. The show’s abbreviated titles stood for; Action into Research for Multiple Sclerosis and was put together by Ronnie Lane, the ex-bassist for The Small Faces and The Faces, who himself had suffered from the condition. Although initially planned to be just a one off show, due to the overwhelming success, subsequent dates occurred in the United States, but with slightly different lineups. 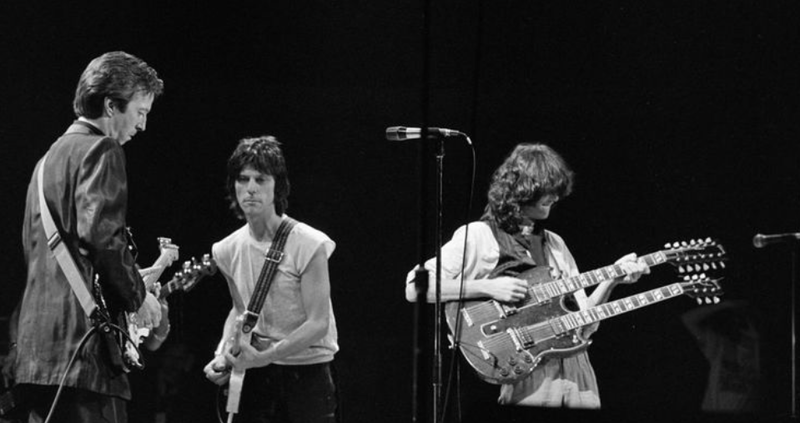 The London show was particularly notable for the fact that it was the first time Clapton, Beck and Page, (all former lead guitarists for The Yardbirds), had performed together on stage. Earlier in the evening, Jimmy Page performed a rare solo instrumental version of Led Zeppelin classic “Stairway to Heaven” which can be seen in the second of the two clips below.